Splitter board with an RGB LED to be connected to a farbwerk controller (item codes 53170/53207) or to a compatible motherboard RGB connector. 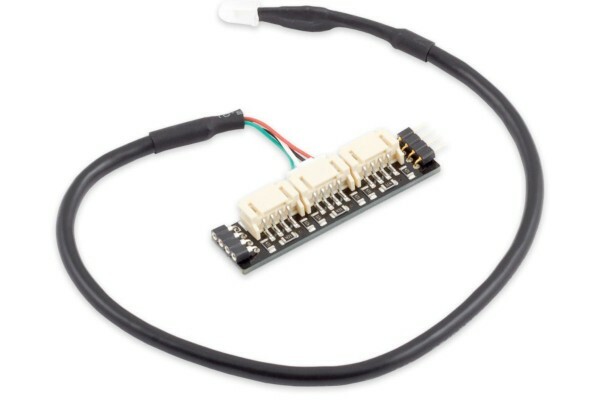 The splitter board can be inserted vertically into a suitable connector, the LED included in delivery can be plugged in from the side. In total, three LEDs can be connected, additional LEDs can be purchased separately (item code 53233). The connector at the end of the board can be used to attach another RGB splitty3 or an LED strip. The included LED has a diameter of 5 mm, suitable for installation in many water cooling components such as aqualis reservoirs, aquatubes or acrylic versions of cuplex kryos NEXT. RGB Splitty 3 is compatible to the Aqua Computer farbwerk and to most motherboard connectors for RGB LED strips. When used with a farbwerk controller, only channels 1 and 4 can be used for RGB Splitty3 due to the spacing of the connectors.